Tuesday: 9:00 a.m. – Noon Advanced Open play bring balls to share Durafast 40. Courts are not reserved. Wednesday: 9:00 – Noon 50+ balls provided. Courts Reserved. Thursday: 6:00 p.m. - ? Advanced Open play bring balls to share Durafast 40. Courts are not reserved. Saturday: 9:00 a.m. – Noon Open Play bring balls to share Durafast 40. Courts are not reserved. Outdoor pickleball will run from June 1, through the end of October. Outdoor pickleball courts at Fabbrini Park are open for play. Six dedicated courts with wind screens and are lighted for night play until 10:00 p.m.
Courts will be reserved for the 50+ Club from 9 until noon on Mondays, Wednesdays and Fridays. Please go to the Triphan Center for your 50+ I.D. The cost of a 2018 50+ Pickleball only I.D. is $15.00. Be sure to let the desk workers know you are are signing up for just 50+ pickleball, otherwise the fee is approximately $60.00 for a full 50+ membership. The Triphan Center is OPEN LATE UNTIL 10:30PM to sign up for the 50+ Club and get your Hoffman I.D. All other times are open play for all ages. Indoor Play: Indoor play at Prairie Stone Goes from November - May. All days are for players 50+. Indoor pickleball at Prairie Stone. ﻿ For those of you who have never played indoors with us, we play indoors at﻿ Prairie Stone Sports and Wellness, located at 5050 Sedge Blvd, Hoffman Estates. Monday: Ladder league until 10:30, then open play until noon. Tuesday: Open Play from 9:00 - noon. Thursday: Open play from 9:00 - noon. Friday: 9:00 - noon, 3 courts for ladies only and 3 courts for open intermediate or advanced play only. When you play at Prairie Stone,the cost is $3.00 for Hoffman residents or Prairie Stone Sports and Wellness members or $4.00 for nonresident/members for each 3 hour session, unless you are a new player, in which case you get the first time free. The passes never expire. Each time you come to play, you go to the desk to check in. You will receive two receipts. You keep one, and you place one in the notebook on a table in the gym. We suggest that you keep track of your receipts in case there's any confusion about how many plays you have remaining. Beginner lessons by appointment. Please contact Bill or Linda at 847-902-9276. Those of you that have a Hoffman Estates 50+ Club card for pickleball are eligible to participate in all the 50+ Club activities. Select the link above to see all the offerings of the 50+ Club. For access to Park District classes, private lessons or semi-private lessons, contact the Hoffman Park District at 847-285-5400. If you order from Pickleball Central, use the code CRHoffman to get a 5% discount on your order. When you do this, our club will also receive a 5% credit on our next club order. ​Gamma Sports has given a 15% discount on most items to our Prairie State Pickleball Club. Enter the code PSPC when checking out. Click on the Gamma logo above to be directed to their website. 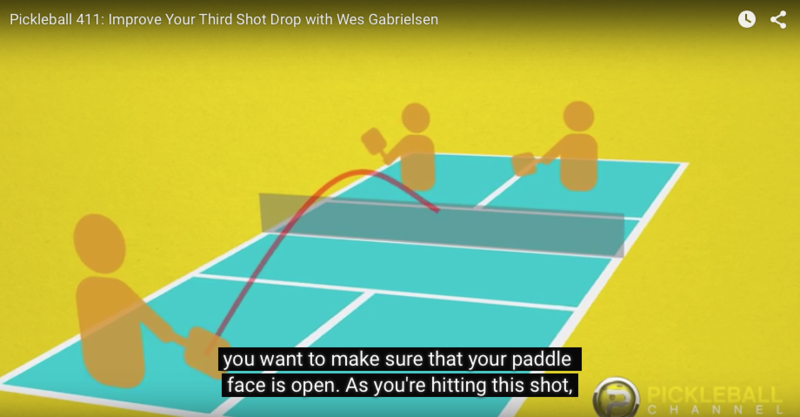 This video should be mandatory watching for all pickleball players! The narration is a little slow, but the explanations, diagrams and video sequences are excellent. This is possibly the best THIRD SHOT video made. Because of constant spam, the contact email has been removed. 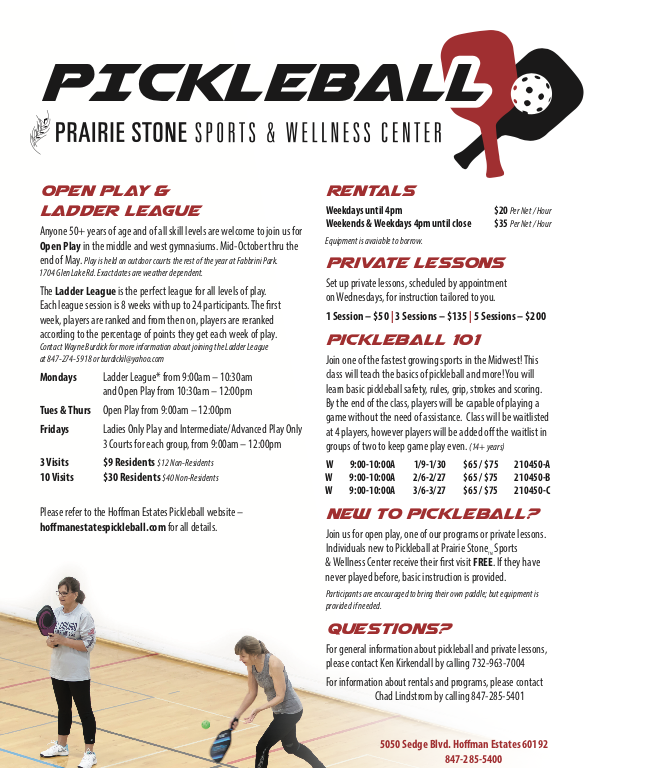 For information about pickleball in Hoffman Estates, call Prairie Stone Health and Fitness Center at 847-285-5400 or contact me through Facebook at Prairie State Pickleball. Prem Carnot, The Pickleball Guru, is the author of the Amazon.com #1 Best-Seller, Smart Pickleball: The Pickleball Guru's Guide. Students rave about the clinics he teaches clinics around the world. To find out once and for all what level player you are and to determine EXACTLY what you need to focus on to take you game to the next level, download his free Ratings & Goals guide at www.RatingsAndGoals.com.